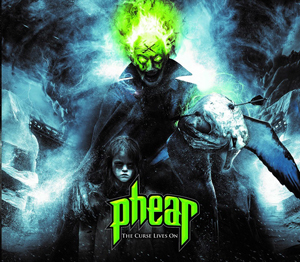 If you long for the sounds of vintage power and thrash metal with a prog twist, then there is a fast-rising band that perfectly fits this description - PHEAR. Comprised of Patrick Mulock - Lead Vocals, Graham Stirrett - Guitar/Backing Vocals, Tyson Emanuel - Guitar/Backing Vocals, Chris Boshis - Bass Guitar/Backing Vocals, Chris Lewis - Drums/Percussion/Backing Vocals, the band is gearing up to issue a five-track EP, The Curse Lives On (release date Friday, June 30th, 2017), which follows their debut full-length, Insanitarium. A video trailer for "Rime Of The Ancient Mariner" has been posted below. Pre-order The Curse Lives On EP HERE and HERE.